Painting by numbers is the perfect introduction for young or inexperienced artists. No need to worry about subject matter or composition, the board has been pre-printed so all you have to do is simply read the instructions and start painting right away. The Artists' Collection Painting by Numbers. Set includes numbered drawing on textured board, 10 pots acrylic paint, paint brush and paint organiser. Acrylic paints look like oil paints but they are water-soluble, becoming dry and waterproof in 30 minutes. Recommended for 8 years and older. Acrylic paints look like oil paints but they are water soluble becoming dry and waterproof in 30 minutes. Each set includes 1 numbered painting board 30 x 22.5cm, 1 brush, 7 acrylic paints, 1 paint organiser. 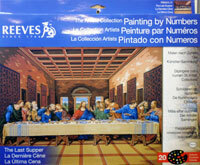 Each set includes a pre-numbered picture, paint brush and 7 pots of acrylic paint. The paints are water soluble, becoming dry and waterproof in 30 minutes. The picture is approx 11 x 18cm.